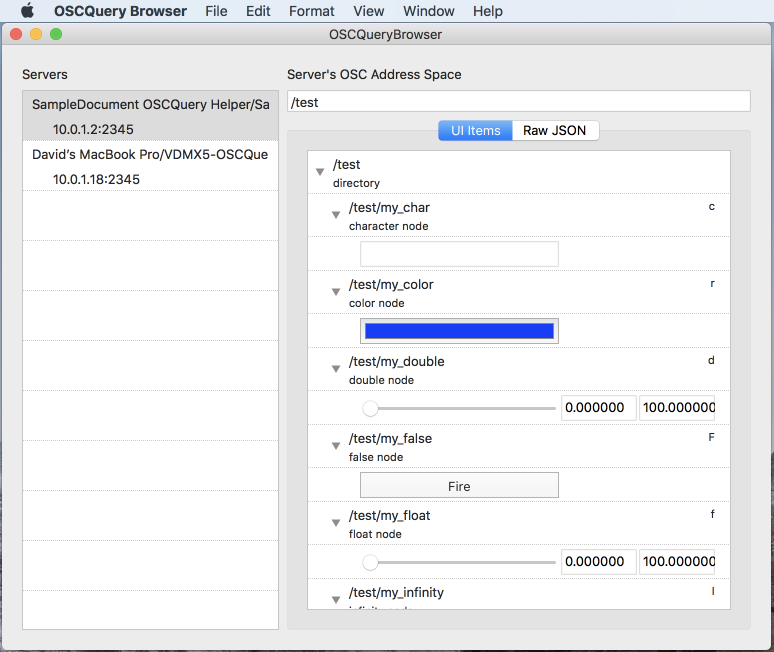 OSCQuery Browser is a simple, free utility for exploring the OSC Address Space of applications that support the OSCQuery Protocol on the local network. While VDMX already directly takes advantage of OSCQuery Protocol, at times it is useful to have a lightweight tool for quickly browsing and accessing published OSC controls on remote systems. The OSCQuery Browser application can also be found on the VDMX dmg in the Extras folder. The OSCQuery Browser interface is broken into two main sections: On the left is a listing of detected OSCQuery “Servers” that can be browsed and the right contains the OSC address space listing returned from the currently selected server. At the top of the OSC Address Space browser section of the interface is a text field that can be used to set the directory within the hierarchy to display. The default is to display the entire namespace from the root directory. The UI Items tab includes interface controls such as sliders, buttons, color pickers and pop-up menus for each of the detected elements starting from the specified directory level. These UI controls can be used to send OSC messages of the appropriate type to the appropriate IP/port combination as described by the server info. Individual controls and directories can be hidden by using the disclosure triangles in the listing. The Raw JSON displays an unmodified version of the JSON data that is returned from the host server. This data blob can be useful for developers who are adding support for OSCQuery into their own applications and general troubleshooting. Note that while some applications support bi-directional OSC messages through OSCQuery for the purposes of keeping UI elements visually in sync across software, it is an optional part of the protocol. OSCQuery Browser which is designed to be a lightweight browsing tool, not a performance interface, and only supports the sending of OSC messages. The free OSCQuery Helper application is useful for publishing OSC Address Spaces for software and hardware devices that do not yet support OSCQuery Protocol natively, but can receive control data over standard OSC. The free MIDI OSCQuery Helper application is useful for publishing OSC Address Spaces for software and hardware devices that do not yet support OSCQuery Protocol natively, but can receive control data over standard MIDI.